For years Laurent has wanted to do stuff in the outdoors with his friends. When we'd go hiking or camping somewhere, he'd say "I'd love to do this with my friends. I wish my friends could experience this part of my life, this part of me." I understand the feeling. Most of our family hiking and camping for the last few years has been done on our roadtrips and working vacations. We couldn't invite someone to just come hiking for the day, or camping for the weekend. But the idea of doing something with friends in the outdoors has persisted. Early last summer on a solo backpacking trip on the Sentier National de Quebec Damien found Swaggin Refuge. It's actually not that hard to find. There's a road you can drive right to it. But we didn't know it existed until he discovered it on his backpacking trip. The Swaggin section of the Sentier National is particularly beautiful with a short waterfall and so we returned there in August; Damien, the girls and I for a summer day hike together. And I fell in love. With that section of the trail, the river, and the refuge. That hike, and others we took last year (as a couple and sometimes as a family) started to open my eyes to the outdoor possibilities north of Montreal in the Laurentians. The two summers prior we took long roadtrips west and didn't have the time to discover our own backyard. Last year we really started to explore the options where we live. 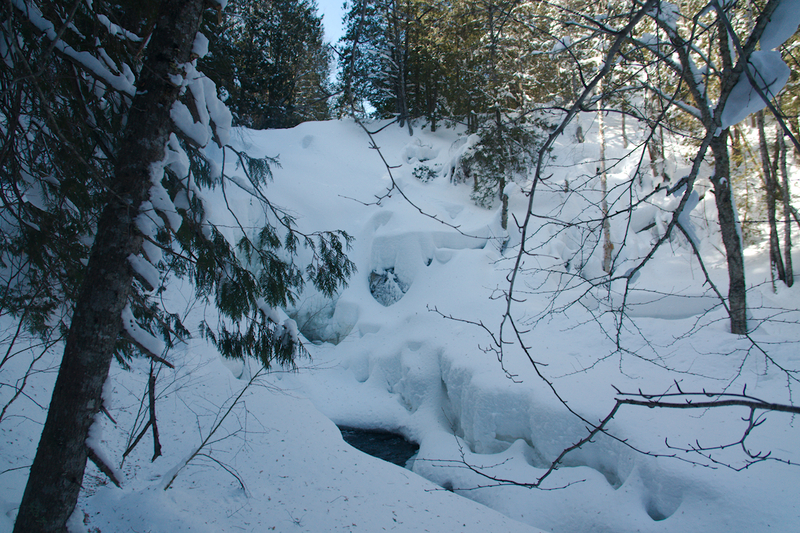 And we noticed the prevalence of refuges in backcountry locations. This is something we haven't experienced other places we've lived and hiked. 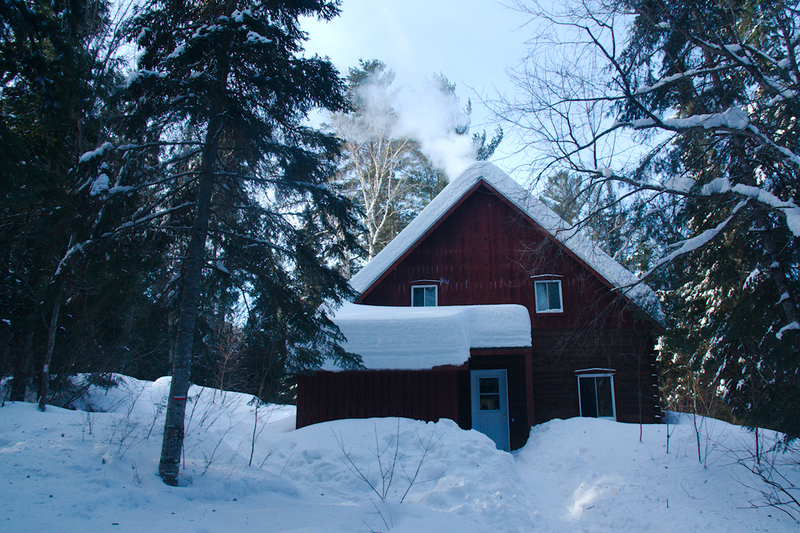 Refuge is the French word, or maybe it's just a Quebec word (I don't know), for a rustic cabin in the woods. 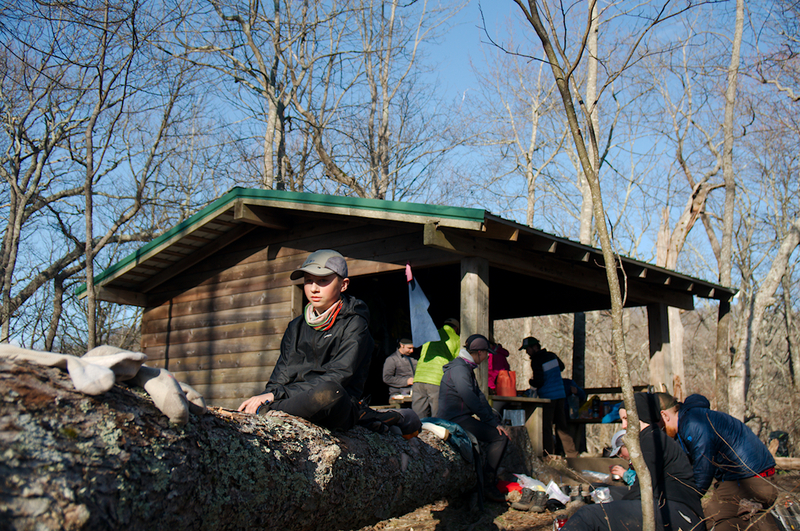 Yes, the Appalachian Trail and the Long Trail have three-sided shelters, which are great places to stay in inclement weather on spring, summer or fall hikes. But they are not the same as an actual cabin, with wood burning stove, four walls, windows and a door that closes to the elements. 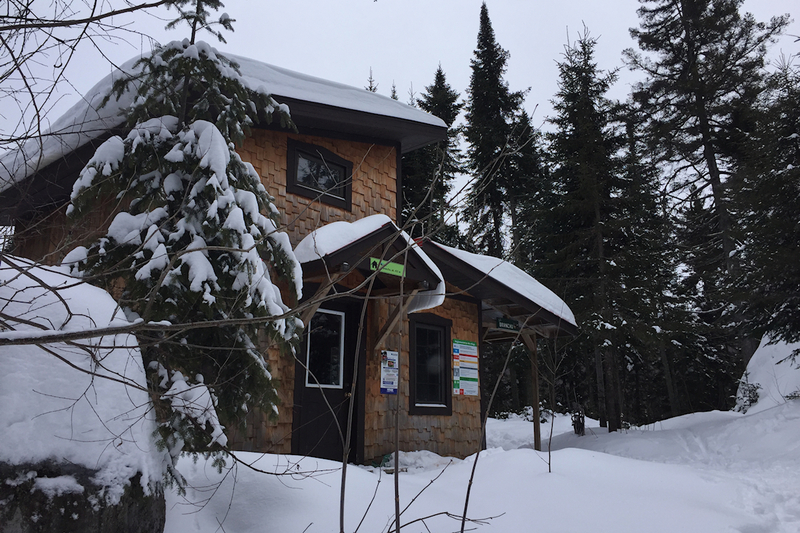 Unlike these three-sided shelters which are free, the Quebec refuges cost money to sleep in, though you can visit for free during the day which is great in winter when you want a warm shelter to eat lunch and drink tea. 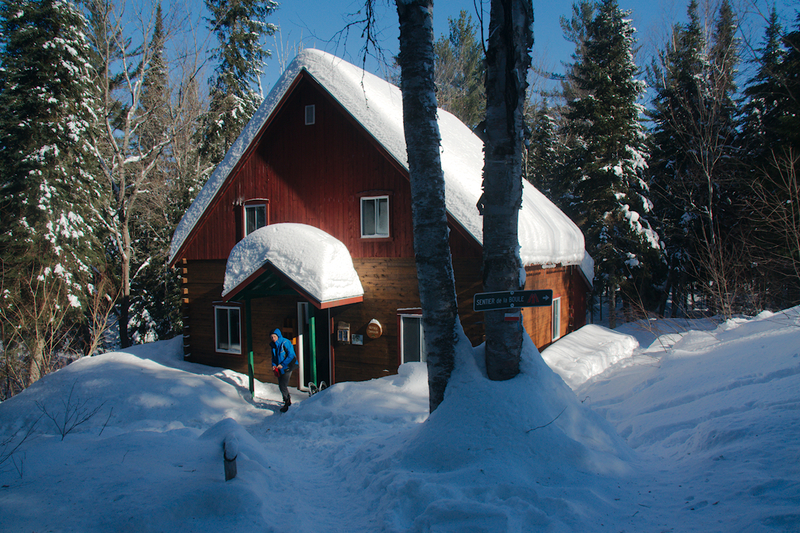 One of the challenges in finding these cabins, and even finding summer hiking trails and winter ski trails, is that Quebec's outdoor network is a patchwork quilt of municipally-owned parks, provincial parks (which they call "national" parks), and federal parks (the truly national parks operated by the Canadian government). There isn't one large trail organization like the Green Mountain Club in Vermont for example, that pulls together all the information in one place. There is the SEPAQ network with its well maintained campsites and trails and helpful website. But unlike many volunteer-run American trail organizations, the government-run SEPAQ system charges user-fees, even just for primitive backcountry camping. When we moved to the Gaspe Peninsula from Maine 8 years ago it was to live in the mountains of that region, an area renowned for its natural beauty and outdoor opportunities. We were spoiled. When we moved to Montreal we knew that Eastern mountain ranges and wilderness areas were within a decent radius of the city: the Adirondacks in New York, the Green Mountains in Vermont, the White Mountains in New Hampshire, the Monteregian Hills of the Eastern Townships, and the Laurentians to the north. 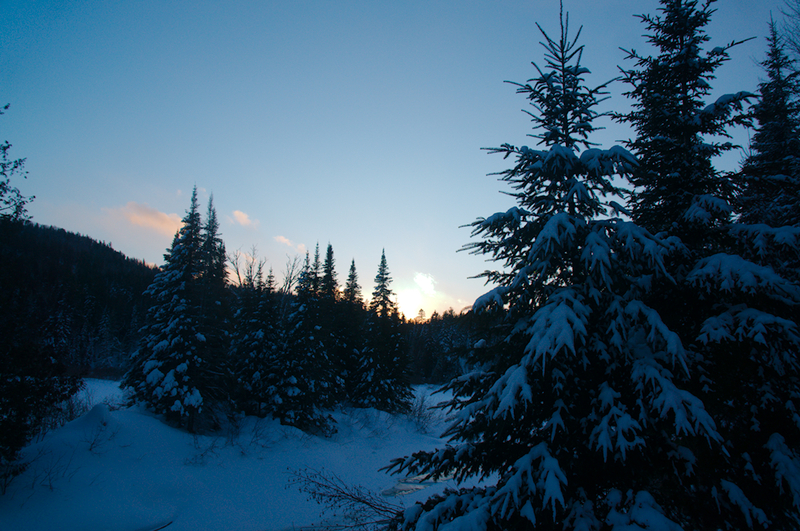 It took us a few years to get into the Laurentians. Part of my heart lives in New England, having lived there for 9 years, and so I would often suggest going south and east for our hikes. But that distance isn't feasible for one day a week excursions. And it was even less feasible for winter day activities. Last summer we started exploring the Laurentians. 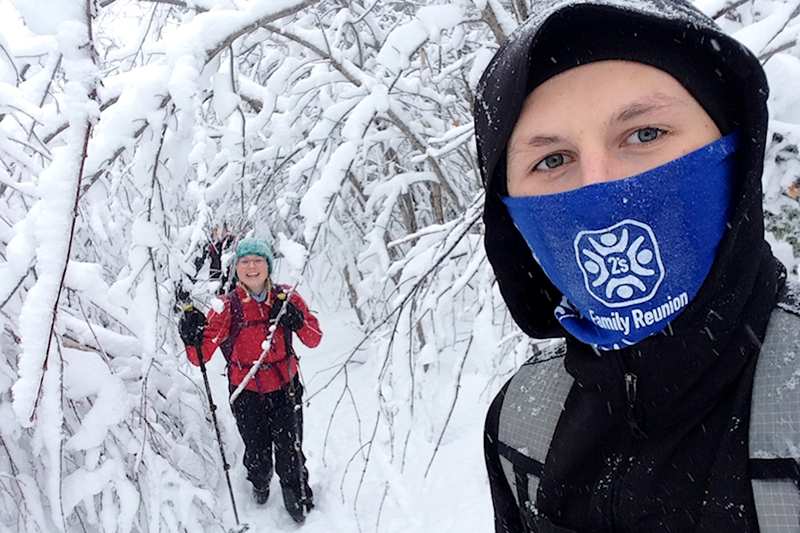 We found the free summer hiking trails, winter ski and snowshoe trails, backcountry ski areas, and a lot of refuges. I started collecting a bunch of regional, municipal, and national park maps and fearlessly searching my way through French websites, piecing together a mental and physical sense of the area. As much as I've learned, I know that a lot of other treasures lie undiscovered, like this municipal ski trail we came across a couple weeks ago that isn't included in my current stash of maps. This sense of possibility, this large swath of low-rise mountains just to our north full of trails, over peaks and valleys, by lakes, rivers and waterfalls, with places to stay along the way (summer camping and winter cabins) has infused me with a sense of hope that I might be able to call southern Quebec home for the next decade of my life, maybe longer. 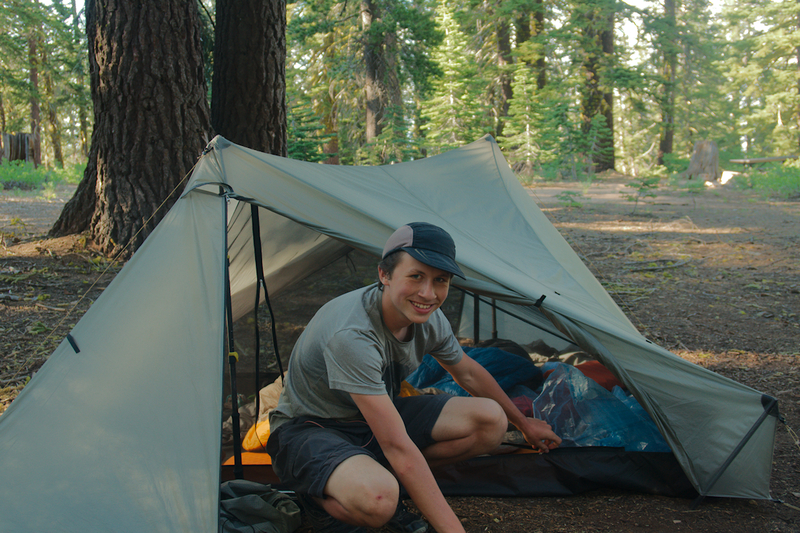 If nothing else, it gave me inspiration for this kid's 18th birthday, and the realization that we could make his wish come true - to be outdoors with his friends, only 2 hours away, and yet a world removed, from city life.